After reaching the Turkish Airlines Euroleague Championship Game three times in four years, Olympiacos Piraeus could not match its high standards last season despite its many quality wins, especially at home. Although the Reds added several new players, the squad found great chemistry right away, led by Vassilis Spanoulis and Georgios Printezis. Olympiacos reeled off seven consecutive regular season wins – including four on the road, to finish first in its group with an 8-2 record. It also got off to a strong start in the Top 16 by downing FC Barcelona Lassa at home and besting Laboral Kutxa Vitoria Gasteiz with Spanoulis as its top scorer. 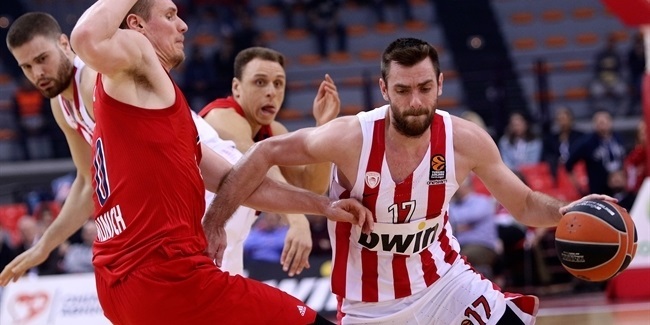 A surprising home loss to Brose Baskets Bamberg stopped Olympiacos in its tracks. The Reds played four of their next five games on the road and lost them all. Home wins against Laboral, Zalgiris Kaunas and Real Madrid brought the team back to life, but a heavy road loss against Khimki eventually prevented Olympiacos from reaching the Euroleague playoffs after 10 consecutive appearances. One of the most successful European clubs of the past decade, Greek powerhouse Olympiacos Piraeus was founded in the 1930s and lifted its first Greek League title in 1949. The Reds’ golden era came in the 1990s, when head coach Ioannis Ioannidis led Olympiacos to four Greek League titles between 1993 and 1996 and to the Euroleague Championship Game in both 1994 and 1995, though it lost against Joventut Badalona and Real Madrid, respectively. When Dusan Ivkovic came to the bench in 1997, Olympiacos promptly became the first Greek winner of a triple-crown – Greek League, Greek Cup and Euroleague titles – the latter by beating FC Barcelona 73-58 in Rome on the shoulders of David Rivers, Georgios Sigalas, Eddie Johnson, Panagiotis Fasoulas, Franko Nakic and Milan Tomic. Olympiacos made it back to the Final Four in 1999 and lifted the Greek Cup in 2002, before coming one victory shy of a spot at the 2003 Final Four. After a few quiet years, the Reds returned to prominence in the 2005-06 season by returning to the Euroleague playoffs and the Greek League finals. Olympiacos finally got back to the Euroleague Final Four in 2009 in Berlin, however, lost the semifinals – as well as the Greek League and Greek Cup finals – to archrival Panathinaikos. In 2010, Olympiacos reached the Euroleague Championship Game in Paris, but Barcelona walked away with the crown. 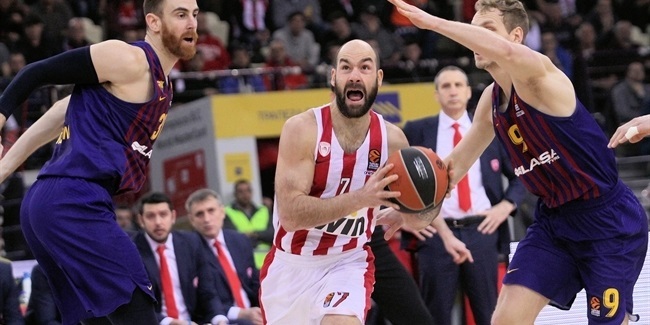 The club added to its trophy case with back-to-back Greek Cups in 2010 and 2011, and with Coach Ivkovic back at the helm, Olympiacos broke the long spell in 2012 by lifting the Euroleague and Greek League titles for the first time in 15 years behind superstar guard Vassilis Spanoulis, and with the likes of Georgios Printezis, Kyle Hines and Kostas Papanikolaou battling and bruising. Olympiacos topped heavy favorite Barcelona in the Istanbul semis, and then rallied from a 19-point deficit to edge CSKA Moscow, 61-62, on a last-second shot by Printezis. 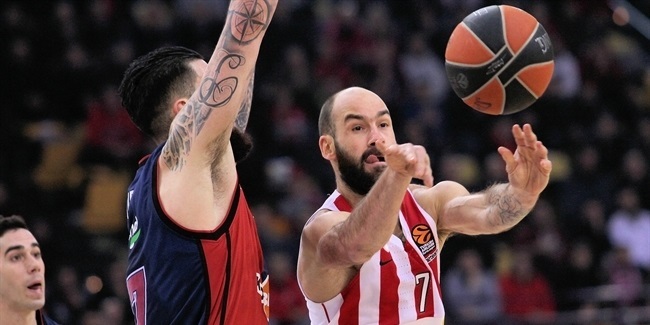 One year later, with new head coach Georgios Bartzokas on the sidelines, Spanoulis repeated his heroics and earned Euroleague MVP and Final Four MVP honors in London, where the Reds sent CSKA and Real Madrid away to defend the Euroleague title in style. Olympiacos missed out on the trophies in 2013-14, but the club returned to the Greek throne and to the Euroleague Championship Game in 2015 season. Under new head coach Giannis Sfairopoulos, Olympiacos cruised to the Euroleague playoffs, where it ousted Barcelona in an instant-classic series on Printezis’s buzzer-beating triple in Game 4. At the Final Four in Madrid, the Reds won a come-from-behind semifinal thriller against CSKA Moscow before bowing out in the title game against Madrid. At home, Olympiacos won 32 of the last 33 league games on the way to winning its second Greek League title in 18 years. Last season, Olympiacos missed the Euroleague playoffs after 10 consecutive appearances, but bounced back in the Greek League, getting two road wins against Panathinaikos in Athens on game-winning three-pointers by Spanoulis to defend its Greek League title. The goal, as always for an ambitious club like Olympiacos, is to do even better in the 2016-17 season.